Omnicef (cefdinir) is in a group of drugs, which are called cephalosporin antibiotics. Such medicines work by fighting bacteria in your body. Omnicef is used to treat many different types of infections caused by bacteria. This medication is also known as a cephalosporin antibiotic and works by stopping the growth of bacteria. This antibiotic treats only bacterial infections. It will not work for viral infections such as common cold and flu. Unnecessary use or overuse of any antibiotic can lead to its decreased effectiveness. patients are recommended to take Omnicef for the full prescribed length of time. Your symptoms may improve before the infection is completely cleared. As we know that Skipping doses may increase your risk of further infection that is resistant to antibiotics. 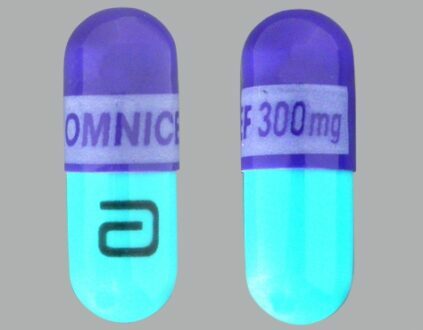 Omnicef (cefdinir) is a semi-synthetic oral antibiotic in the cephalosporin family of antibiotics. Like other cephalosporins, cefdinir stops bacteria from multiplying by preventing bacteria from forming the walls that surround them. The walls are necessary to protect bacteria from their environment and to keep the contents of the bacterial cell together. Bacteria cannot survive without a cell wall. Cefdinir is active against a very wide spectrum of bacteria. The FDA approved cefdinir in December 1997. You can find all relevant information about this medicine here. Omnicef is used to treat strep throat and strep throat with tonsillitis. It is also used to treat middle ear Infection, acute maxillary sinus S. Pneumoniae bacteria infection, acute maxillary sinus H. Influenzae. It is especially good for infections which are caused by bacteria like acute Maxillary Sinus M. Catarrhalis and Bacteria Infection. It is also used to treat skin Infection due to Staphylococcus Aureus Bacteria and Skin Infection due to Streptococcus Pyogenes Bacteria. In addition, it is considered very good for the treatment of Pneumonia caused by different bacteria such as Pneumonia caused by Haemophilus influenzae, Pneumonia due to the bacteria Haemophilus Parainfluenzae, bacterial Pneumonia caused by streptococcus, Pneumonia caused by the Bacteria Moraxella Catarrhalis, Bronchitis caused by the Bacteria streptococcus Pneumoniae, Bronchitis caused by the Bacteria Haemophilus Influenzae, Bronchitis caused by Haemophilus Parainfluenzae Bacteria and Bronchitis caused by the Bacteria Moraxella Catarrhalis. Omnicef’s side effects can be sever if you are taking some other medication or if you are allergic to some elements of this compound. Do not take Omnicef if you are allergic to cefdinir, or even to similar antibiotics like Ceftin, Cefzil, Keflex, and others. Before taking Omnicef, tell your doctor if you are allergic to any drugs ,especially penicillin, if you are suffering from kidney disease or if you have a history of intestinal problems. Get emergency medical help if you have any signs of an allergic reaction like hives, difficulty in breathing or swelling of your face, lips, tongue, or throat. like other antibiotic medicines, Omnicef can cause diarrhea, which may be a sign of a new infection. In case of watery or bloody diarrhea, stop taking Omnicef and call your doctor. Do not use anti-diarrhea medicine unless your doctor tells you to. according to FDA, Omnicef is not expected to be harmful to an unborn baby. But to be on safe side and tell your doctor if you are pregnant or plan to become pregnant during treatment. increased thirst, loss of appetite, swelling, weight gain, feeling short of breath, urinating less than usual or not at all. Take this medication by mouth, with or without food, usually once a day, or twice a day every 12 hours, or as directed by your doctor. Usually, the dosage is based on your medical condition and response to therapy. It is strictly advised to stick with recommended dose. Do not take more than the maximum recommended amount of 600 milligrams per day. It is advised to take this drug at evenly spaced intervals because antibiotics work best when the amount of medicine in your body is kept at a constant level. Continue to use this medication until the full prescribed amount is finished even if symptoms disappear after a few days. Like all other antibiotics, Omnicef may allow bacteria to continue to grow, if you stop it too early, which may result in a relapse of the infection.